Hot soaks of the Himalaya: Into the wide open? Located in the north-western tip of India, the state of Arunachal Pradesh, covers a tremendous amount of terrain, not much smaller than the whole of Nepal. The former contained more than 40 hot springs so it's not surprising to see that Arunachal Pradesh has quite some thermal activity, though possibly less developed and / or visited. It's therefore understandable that there's less info on the internet available. Re-known for the many different ethnicities, Arunachal Pradesh is distinctly remote, little roads offer any kind of access. Tawang district bordering both Tibet and Bhutan is accessible and contains largely Tibetan Buddhist ethnicities. As one of the most accessible mountain areas it's not surprising to find that (as is the case with Bhutan to it's east) there are a number of hot springs not far away from Tawang itself (relatively speaking ...). 'Tsachu hot spring which can be reached by traveling by a light motor vehicle for two hours from Tawang up to Sarong Gonpa and trekking from there for another three hours'. 'Tsachu Hot Spring can be reached by travelling for 4 hours by a vehicle and another 4 hours on foot'. 'Apart from hot spring, this site is also suitable for hard trekking'. 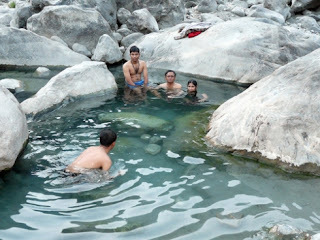 The hot spring of Thingbu is located 68 km away from Tawang town. Apparently a pony is the most used form of transport for the final stretch from the roadhead. 'It is about 40 kms away from tawang town.This hot water spring and ‘ Manchu’ provides warm, sulphur rich water and cures many ailments'. 'Monpa, Sherdukpen, Miji and Aka tribes take holy bath in these hot springs in the belief that their sins will get washed away. They also take a dip in the water for 1–3 h for healing any kind of skin disease. 'where the water is so hot that “yak meat is cooked in 20 minutes”'. 'The other famed tourist spot is the Hot Water Spring, which is also the main attraction for locals, who supposedly take bath in the Hot Springs as its water is said to possess curative properties. However, I was most dejected after having undertaken a long trek down from the main road, as an Ecological Camp has come up at the site, with a Cafeteria right in front of the Hot Spring, which is not only blocks the view of the Hot Spring, but also creates more ecological hazards, rather than preserving the ecology there for which it is meant & sounds. The local environment department needs to take a look at this, before it gets too late to redeem the hot spring'. 'We had the exact same reaction when we went to check out that hot spring at Dirang. I would have expected at least a little bit of improvement there from 8 years back'. Lower Dirang valley contains a hot spring near the village of Jia. 'Bhalukpong, which lies about 85 kilometers away from Bomdila on the foothills of Aka ranges, is an ideal picnic spot. The picturesque site is also a home to the Jia-Bharali river and a hot spring, which is believed to have a medicinal value (source)'. More to the east, Anjaw district contains two hot springs, one named Walong circle, the other Kibithoo circle. 'Located 20 km away from the Chinese border, Walong is situated on the western bank of river Lohit in Anjaw district. The mesmerizing place is famous for its hot water spring and the Namti valley. The hot spring is located amazingly at the confluence of river Dichu and Lohit. It is a major attraction of Walong and tourists fly to the place to take a soothing bath in the medicinal water of the hot spring'. As always when there is little reference material, some caution is required as often different names as used for the soak!